The brainchild of producer Mike Spalla, Jingle Cats combine the beauty of your Christmas favorites with the soothing tones of meowing cats. 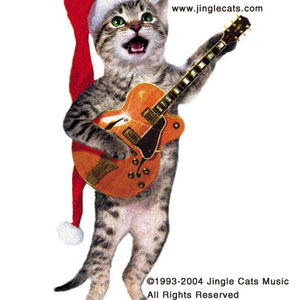 The Jingle Cats began their recording career in December 1991, when a precocious kitten named "Cheesepuff" crawled into a Hollywood studio recording booth and began meowing along with the song Jingle Bells, which was being recorded in a session at the time. The studio engineer, Mike Spalla, recorded the meows and adjusted the timing to the music to make the first cat singing in recorded history. The song was sent to Kiss-FM in Los Angeles and POWER-106 where it was played on the air the next day, Christmas Day. The following year, the Jingle Cats cassette was presented at the KLOS Classic Rock Expo in Los Angeles. 1,000 cassettes were distributed by City Hall Records in San Rafael, California. KNBC (Channel 4 News) in Los Angeles broke the story on Dec. 10, 1992 and the Jingle Cats sold out in about one hour. In all, it took more than 1,000 meows, screeches and growls to assemble the 20 melodies of their debut album. A gem deserving of a place within any audiophile's collection, Jingle Cats' 1993 album "Meowy Christmas" (with frequent features by the Jingle Dogs) quickly became a smash hit, reaching number 10 on Billboard's catalog chart. The album featured holiday classics such as "O Christmas Tree", "God Rest Ye Merry Gentlemen", and "Deck the Halls". It was later followed by three other albums: Here Comes Santa Claws, Rhythm and Mews, and First Meowel.